I absolutely love this 12×12 Cardstock Collection, Amberley Grace, from The Angel Company. It is so elegent and the colors so beautiful. I made this card for my husband as a reminder to “notice the rainbow in the midst of the storm”. For those of you who don’t know, I live in Indiana . There were tornados and severe thunderstorms the night before last and into the early morning hours yesterday. When the rain was finally over, our ranch style house was in the middle of a lake with 2 feet of water in the crawl space and water in our garage. Our sump pump just couldn’t keep up with the 4 inch down pour. It was quite a mess and a long day waiting for the plumber to arrive to pump the water from under our house. And though it was a stressful day, it was just an inconvenience for us. We were lucky. There are plenty of people in the surrounding cities whose homes were destroyed and family members killed. So I tell my husband to be thankful it was just a little water, an inconvenience, and that nothing happened to our “little rainbows”. All supplies are from The Angel Company. 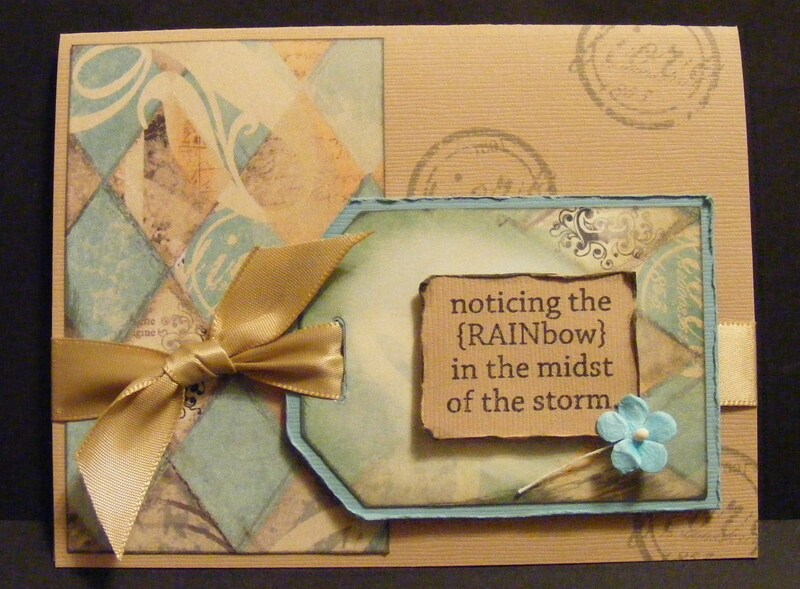 This entry was posted in Cards and tagged Greeeting Card, Rainbow, rubber stamping, Storm, The Angel Company. Bookmark the permalink. I love this card so much! It is just gorgous! Great blog Kandy! I am going to link yours on mine! Stamp ON!